120 pages, published July 2014. In chapter 18 entitled “Root Cause of Enmity” the author presents facts and compelling arguments which explain why Ramalingam was persecuted in various ways by orthodox Saiva Siddhanthans who condemned him for teaching that Siva was to be found within through meditation on the Supreme Grace Light, Arutperun Jyoti, and that through this the soul’s sins or fetters could be dissolved, and one could unite with the Lord. “The shop was opened. But there was none to buy. So the shop was closed. I am going to close the door of my room. You believe that God is now in the flame of the lamp. Therefore you worship the flame of the lamp without wasting your time. You do meditation before this flame of the lamp keeping in your mind what I have stated in the 28 Poems commencing with the word “Ninainthu, Ninainthu”. 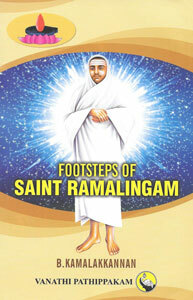 The author is a long time scholar of Ramalingam’s writings.